So I thought I’d have been able to get a blog post or something out since the last one, but I guess not. Between more offsite training to learn another programming language and finding a cute boy with whom I sense a good deal of potential, I haven’t had much time for chores, much less a conjuration or something. I blame Mercury being retrograde as for my lack of updates, since it’s supposed to be a good time to review and remember. In fact, I tried calling up Michael again today, you know, the archangelic king of fire, to talk to him about a few things. No response. Guess I should try to actually chat with him through his form as the King of Wands first before rushing things more; the ritual can wait, I suppose. However, I haven’t been completely idle. I ordered a natal chart reading from Christopher Warnock over at Renaissance Astrology, which was awesome. Good information in all the various parts of my life (apparently I’ve got a problem with jilted lovers becoming secret enemies of mine, who knew? ), but as far as magic and the occult goes, I’ve got a very strong connection with Saturn. He’s dignified in Sagittarius in the 9th house conjunct Uranus; my friend over at The Unlikely Mage said that that sort of position is like bringing a torch down into ancient tunnels of knowledge, and it’s true: I like older styles and forms of ritual and the occult, and I’ve got a passion for Latin and classical culture. Plus, with Uranus in the mix there, I’m also apt and able to update some methods and blend new styles into the old to create forms both awesome and, at its heart, traditional all at once. Nifty! Plus, I might be well-advantaged to take up more Saturnian arts such as necromancy and binding and other occult, hidden arts. However, since I’ve got other things on my plate right now, I’ll hold off on chatting it up with Tzaphqiel until a little later. I’ve always felt happy and pleasant about dealing with Saturn, but that doesn’t lessen its roughness to work with. Shifting gears for a bit: while I don’t have a magical altar set up, I do have a devotional altar which I pray at and make offerings and stuff. Since I had a chance to light a lot of candles, the altar looked awfully pretty, so I took a picture of it. The center candle is the first one lit, and is (or should be) lit whenever I’m home; this candle represents the light of God and is like my own Lamp or Eternal Flame. 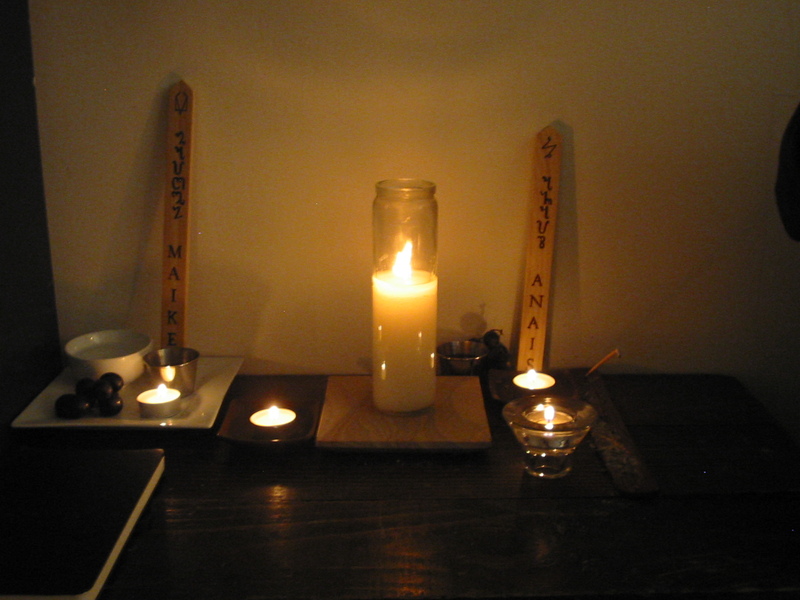 On the far left is a votary offering for the genius and other spirits of my home, with an offering of fresh water, wine, grapes, and a lit candle. The inside left candle is an offering for my natal genius. The candle on the right in the back with the spirit placard is an offering to the genius and spirits of the land around my apartment, along with an offering of wine and grapes. The candle on the right in front is lit in honor and thanks for Saturn; I time my prayers to coincide with the planetary hour and day of the god I’m making these offerings to, and I dress the candle in the colors and symbols appropriate to that particular deity as well as light some incense appropriate to that god. In this case, I had a candle painted black with the seals, sigils, and symbols related to Saturn and lit a stick of myrrh incense. The whole getup is rather pretty, I think. Eventually I’ll get other figurines and statues and things to put up, but this is what I have set up on a fancy day. I only light candles to the genii of my apartment and land when I make offerings, but since I hadn’t given one in a while, I decided to go ahead with that today. Your ordered practices make me look like a flighty crystal licker. The constrast often makes me smile. Ordered practices? You flatter me; I assure you, it’s something more like “did I drink too much last night? is it the right day? okay, let’s get this over with”.